What is Corneal Collagen Cross Linking? Corneal Collagen Cross-linking with Riboflavin (CXL, surgical code C5130) is a non-invasive treatment for keratoconus that has been shown to strengthen the weak corneal structure. 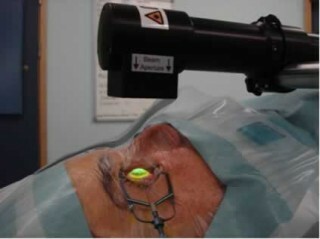 Clinical experience with the procedure goes back to 1998, with 6 year follow-up data indicating long-term efficacy in stabilising keratoconic corneas (Journal of Cataract and Refractive Surgery 2008). The cornea is made up of many layers of collagen arranged in a very regular pattern. These layers of collagen are called the stromal lamellae. The collagen fibres of neighbouring layers are linked together to provide strength to the cornea. In conditions where the cornea is abnormally weak, such as keratoconus, there are fewer of these links and the result is bulging of the cornea. CXL works by increasing collagen cross-linking. The fibrils of the keratoconus cornea lose their ability to link to each other. CXL treatment causes more cross linking of the fibrils, making the cornea stronger. The two figures above show the parallel corneal layers (white) and the collagen cross-linking (red) which are increased after Corneal Cross Linking treatment. A healthy eye (fig. A) is more spherical in shape, allowing an image to come into focus clearly. The cornea of an eye with keratoconus (fig. B) bulges outward, creating a cone-like shape and distorted vision. Is CXL suitable for all keratoconus patients? CXL is most suited to patients with progressive keratoconus. That means patients whose glasses or contact lens prescription is changing quite frequently, or whose vision is becoming worse despite using contact lenses, or whose corneal topography maps show progression of keratoconus. CXL is a relatively new treatment and its place in the treatment of keratoconus is still being defined. This will become more apparent as more people are treated around the world and the results of these treatments are published; however current data suggests that most people with early-moderate keratoconus would benefit from CXL treatment to prevent their condition from progressing. The UK medicines and treatments regulator (NICE) updated its guidance on CXL in september 2013, supporting the use of the procedure. Patients are advised to read the guidance and information for patients accessed from the NICE website ( www.nice.org.uk/IPG466). I have experience of using CXL since 2008, and have been very impressed with the successful outcomes for my patients. I think that the need for major, invasive surgery such as keratoplasty (corneal transplant) will be significantly reduced in the future by the protective effect of CXL. The cross-linking treatment is a day-case procedure. It is commonly performed under topical anaesthesia (i.e. drops are applied that numb the eye), but general anaesthesia (the patient asleep) may be used when needed, e.g. in paediatric cases. An alcohol solution is used to gently lift the corneal epithelium away from the cornea (epithelium-off). Riboflavin eye drops (vitamin B2) are applied to the cornea over a 30-minute period. The riboflavin becomes well absorbed into the cornea and also enters the fluid in the front part of the eye. This is essential because the next stage of the treatment involves a controlled exposure of the eye to ultraviolet (UV) light for 10-30 minutes (depending on the intensity of the UV source). The riboflavin molecule is very good at absorbing UV light. This means that the riboflavin in the cornea is activated by UV light and the riboflavin inside the eye protects the internal structures (such as the corneal endothelium and the lens) from the effects of UV light. This simple process has been shown to increase the amount of collagen cross-linking in the cornea and so strengthen the cornea. You will have a contact lens bandage on your eye for a few days, and you will be asked to put antibiotic drops in your eyes for 2 weeks to guard against infection. The treated eye is usually painful, red, light-sensitive and watery for up to 3 days, and then is uncomfortable for the next few days while the abrasion is healing. The intensity of post-operative pain does vary considerably from patient to patient. I will prescribe pain-killers to take by mouth, and ‘rescue’ anaesthetic eye-drops. The anaesthetic eye-drops can only be used for the first 12 hours post-operatively, as if used for longer then do slow-down or prevent healing. You should expect to take 1 week off work following the treatment, and allow for the possibility that it might be longer if you experience complications, or heal more slowly. You should not drive for at least 1 week. Swimming should be avoided for 2 weeks, return to other sporting activities can be as soon as the patient feels comfortable enough to take part. Contact lenses should not be worn until 4 weeks after CXL treatment. The shape of the cornea will typically take 3 months (or longer) to stabilise and during this time your vision may fluctuate. Only once the cornea has become stable should you consider having a new glasses prescription or a contact lens fitting. Corneal infection (keratitis): onset of increasing pain and/or reducing vision after initial improvement in the post-treatment recovery period could mean infection, and you will need to seek medical help on the same day. Corneal opacity/haze: mild corneal haze is common and short-lived (1-4 weeks) after CXL, and is caused by inflammation within the cornea in response to the UV-light. More severe inflammation may require treatment with steroid eye drops to control it. Permanent corneal opacity or clouding is possible but rare, and may result in the best-corrected visual acuity being worse than before CXL treatment. Corneal melt and sterile inflammation: rare bu potentially serious, this is seen most commonly in keratoconi patients with uncontrolled periocular inflammation e.g. in atopic eczema/asthma/conjunctivitis. If you have this condition you will need treatment prior to CXL to minimise the allergic activity present at the time of CXL. Ultraviolet light is potentially harmful to the innermost layer of the cornea (the endothelium). 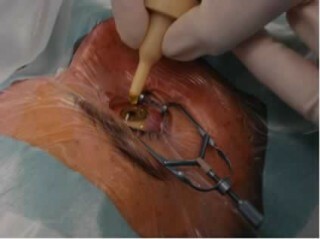 In the event of endothelial failure then corneal transplantation would be necessary. This complication is very unlikely with the ultraviolet dose used in our treatment protocols. CXL strengthens the cornea and halts the progression of keratoconus. When the cornea has stabilised, glasses or contact lenses may be required to provide the best visual outcome.